The Association of Maritime Truck Owners (AMATO) has suggested that the relocation of trucks to their parks, garages or the trade fair complex would solve the perennial problem of gridlock. The Chairman of the association, Chief Remi Ogungbemi, made the suggestion in an interview with the News Agency of Nigeria (NAN) in Lagos. He said the initiative would ease the problem of trucks blocking the roads and leaving other motorists to suffer long hours in traffic jam. “My ultimate goal is to achieve sanity and orderly movement of trucks in ports operation. “I suggest that all trucks on the ports access roads should relocate to their parks or garage. “Anyone without garage should go to the trade fair complex, which is available as park for them,” Ogungbemi said. He said that while such relocation would be ongoing, the system could be perfected with the commencement of an electronic call-up system for the trucks. He said in that vein, a synergy would be necessary among the Lagos State Government, the Nigerian Ports Authority (NPA) and the Nigerian Shippers’ Council (NSC). “This is when we need a synergy among the critical stakeholders; the state government, the NPA and the shippers’ council which is the economic regulator. “We have been in talks with the NPA on how to get a truck park that can hold these trucks while they wait for their turns to get into the ports. “I am sure that a lot of benefits await all parties concerned if it works out well,” Ogungbemi said. NAN reports that the gridlock, particularly on the port access areas, resurfaced when the trucks returned to work after a 10-day strike. Efforts of the taskforce on traffic management within the port city, however, helped to ensure that the trucks left a lane free for other motorists. 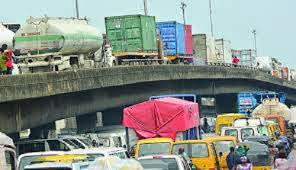 NAN also reports that the strategy helped to maintain a level of sanity within the Apapa area, but caused a long stretch of gridlock along the Ikorodu expressway between Monday and Wednesday.